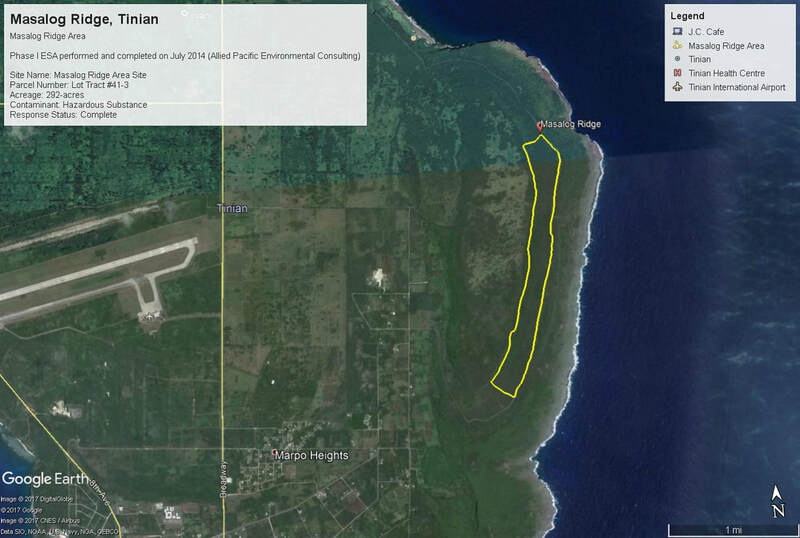 The size of the area of interest is about 292 acres, which is part of a largest ordnance storage depot located in what is known as the Masalog Ridge Area, Tinian. The US Military used the site immediately following the capture of the Mariana Islands in World War II to stage ordnance for aircraft, especially B-29 Bombers for the invasion of Japan. The ordnance storage area was extensive, consisting of over a hundred open revetments with unknown number of ordnance scattered throughout the area. The UXO contamination occurred after World War II, during the Trust Territory of the Pacific Islands government (which was administered by the US government), prior to the Landowner acquiring the property. The property was returned from the Trust Territory government when the CNMI government was created in 1976. The property is currently owned by the Department of Public Lands (DPL), which is in charge of managing public properties in the CNMI and is under the Executive Branch of the CNMI government. These unexploded ordnance (UXO) and potentially other WWII vintage explosive components present a significant health hazards to general public. The site has remained idled and undeveloped since after its use as an ordnance storage depot. The 292 acre Masalog property is owned by the Department of Public Lands (DPL), compromised of Lots Tract 41-3. The site is located approximately two miles northeast of San Jose Village and approximately two miles of the Tinian Airport runway. The property is a narrow strip of land in which curves along the shoreline on the east of and along the Pina Plateau. The lands slopes generally southward from an elevation of approximately 350-360ft. above sea level to sea level at the top of the plateau to approximately 180 feet above sea level on the eastern border of the property. The majority of the coastline is comprised of cliffs approximately 30ft. high. There are two sandy sections of beach. At this time, the property is undeveloped and heavily vegetated. Coordinates: N-14° 59' 46.939" ; E- 145° 39' 57.690"
Response Status: November 26, 2008, AMPRO LLC conducted an Unexploded Ordnance (UXO) Survey for the Department of Public Lands to help identify potential site to relocate the public landfill facility. The proposed site happened to be an area used during World War II as an Army Air Corp ordnance storage facility in support of the North field B29 flight operations; Phase I ESA completed on July 2014;, Phase II ESA in 2015.